The annual Heritage Land Rover Show continues in its one-day format on May 1st. There will be the normal displays from clubs, accessories and tradestands. The Land Rover Experience which will have various displays as well as rides around the new 4x4 Adventure course. 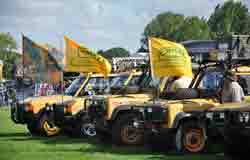 It's a big gathering of Land Rover enthusiasts with many models on show plus the arrival of the annual Land Rover Heritage Run from Lode Lane, Solihull, to the Heritage Motor Centre.